Holiday celebrations often center around the Christmas tree. Each year, it is estimated that Americans put up more than 30 million live Christmas trees. Picking the right tree and caring for it properly can ensure a safer, longer-lasting tree. These simple steps show you how. Picture above: It is all smiles for Coach Doug Peirick and his team after winning third place by defeating Hermann. Picture above: The governor’s Christmas tree shines against the glowing Capitol dome in Jefferson City. On Friday, Gov. Jay Nixon and his wife Georganne led the annual tree lighting ceremony at their home. The White House - Alan B. Krueger - Today’s employment report provides further evidence that the economy is continuing to heal from the worst economic downturn since the Great Depression, but the pace of improvement is still not fast enough given the large job losses from the recession that began in December 2007. Pictured above: Lindsey Nixon drains a three as time expired in the third quarter. 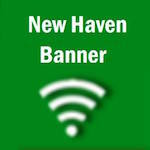 New Haven turned up their defense in the second half, holding the Hawks to just six points and propelling the rocks into Sat. night’s championship game.